Viacom, the parent firm of cable networks MTV and Nickelodeon, has told popular video sharing site YouTube to remove 100,000 "unauthorised" clips. YouTube and its parent Google failed to install tools to "filter" the unauthorised video clips, said Viacom. The firm said after talks over several months YouTube seemed "unwilling to come to a fair market agreement" to let readers access Viacom content. YouTube has said it will comply with Viacom's request. The firm said that it works with "all copyright holders to identify and promptly remove infringing content" as soon as it is officially notified. But it added that it was "unfortunate" that Viacom would no longer be able to "benefit from YouTube's passionate audience which had helped promote many of Viacom's shows". The latest move comes after the Japanese Society for Rights of Authors, Composers and Publishers made a complaint of breach of copyright in November. In response, YouTube agreed to remove some 30,000 files from the site. 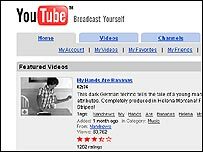 While some sites, including CBS, have struck deals allowing YouTube to use their video clips, others are still negotiating similar agreements. Will Google's $1.65bn gamble on You Tube pay off? Has the dotcom boom returned?